We’d love your help. Let us know what’s wrong with this preview of Crushes, Codas, and Corsages by Michelle Schusterman. The band has been preparing for their big regional competition all year and it's time for all of their work to pay off. 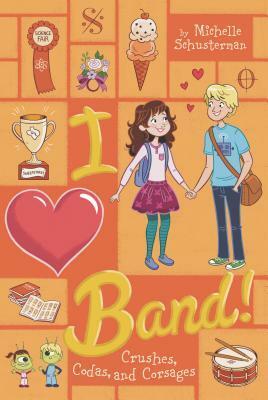 On top of preparing for competition, Holly is excited to go to the Spring Dance with Owen, but is he still interested after meeting a n Former band director Michelle Schusterman ends her adorable series about middleschool band geeks with the perfect coda! The band has been preparing for their big regional competition all year and it's time for all of their work to pay off. On top of preparing for competition, Holly is excited to go to the Spring Dance with Owen, but is he still interested after meeting a new girl at art camp over spring break? Holly and friends band together to have an amazing end to their seventh grade year. To ask other readers questions about Crushes, Codas, and Corsages, please sign up. I was given this as a bonus to Michelle Schusterman's book "Dead Air" (which is an amazing book). Thank you SO much Michelle. I wasn't sure what to expect from this read, other than it being well written. But WOW...what an awesome book. I loved all the characters, and the storyline..the title covers it all! The humor is great - and had me cracking up. I'm very happy I had the opportunity to read this, it was a refreshing change from the last (boring) historical fiction I read. The cover is brillia I was given this as a bonus to Michelle Schusterman's book "Dead Air" (which is an amazing book). Thank you SO much Michelle. The cover is brilliant too. This is a girlie-girl series (I can't really see a boy reading it and enjoying it much). The cover is very well designed, I even love the glitter title! The school year is starting to end, but everything is getting more intense as the science fair approaches, it’s almost the spring dance and the big year end concert/competition is underway. Holly and Seth are still friends, but are they more than friends? Holly doesn’t think so until Seth starts talking about Ginny, his partner at a drawing class he attended, and now Holly is jealous! Maybe Seth is a boyfriend after all! Another great clean read. This was a fun series; well written, fast paced a The school year is starting to end, but everything is getting more intense as the science fair approaches, it’s almost the spring dance and the big year end concert/competition is underway. Holly and Seth are still friends, but are they more than friends? Holly doesn’t think so until Seth starts talking about Ginny, his partner at a drawing class he attended, and now Holly is jealous! Maybe Seth is a boyfriend after all! Another great clean read. This was a fun series; well written, fast paced and full of 7th grade drama (best friends, boy friends, homework etc.) Buy the whole series, this is #4. Loved the series and would love to see a follow-up series (or series of stand alone novels) as the characters move through the rest of their school years. It was everything I'd hoped for as the last in the series! It's rare to find such a true rendering of middle school band. Also, of middle school science class. Easily one of the best books I've ever read. So adorable and SO funny!